Saturday, December 8th, 2018 from 5:30p.m.-10:30p.m. This is a Formal Affair w/ Black Tie Optional. See below for ticket & sponsorship level details. If you would like to mail in your RSVP please click here to print the RSVP form. If you would like to donate a silent auction item please click here for the form. Would you like to extend your stay the evening of the Gala? 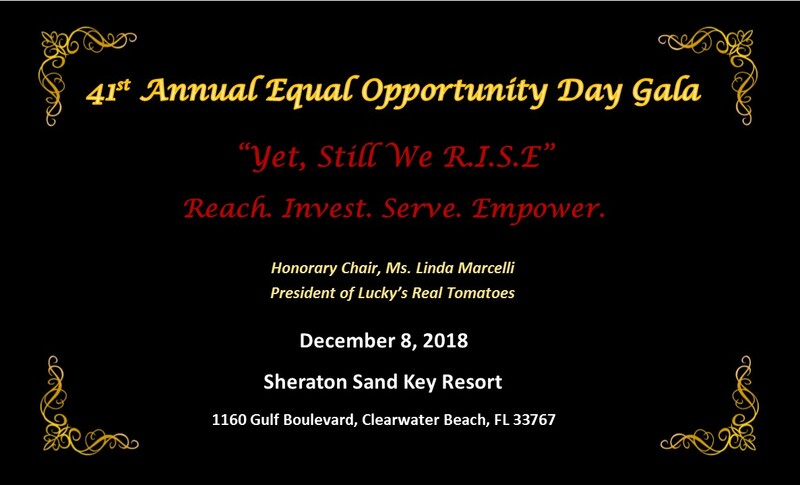 The Equal Opportunity Day Gala is Pinellas County Urban League's annual premier fundraising event. In the Urban League's mission to obtain equality for all, this gala celebrates the achievements of those within the community and abroad that strives to create an equal opportunity environment for everyone. This event continues to draw strong support from community leaders and members, state and federal officials, and a number of Fortune 500 companies. Our primary goal is for every citizen to obtain economic and social equality and our organization achieves those goals by focusing on four key areas: 1) Education, 2) Workforce Development, 3) Financial Empowerment & 4) Health. By providing quality and targeted programming in those four areas, PCUL help close the achievement gap for individuals and families within the communities throughout the Tampa Bay Area that are disproportionately affected. Each year PCUL directly impacts over 12,000 residents; and as always, we look forward to making a greater impact each year with your help.